I've spent many Christmases working at Colonial Williamsburg and loved every minute of it. . . .Getting caught up in the festivities, it made Christmas away from home more like a labor of Love. And the food! Oh My! . . .It's an experience in itself. . . .One of the reasons I didn't mind working Christmas Day was the food. . . .Christmas Dinner was banquet tables--yes, tables--of culinary favorites from the Colonial Williamsburg chefs. . . .Recipes from the taverns, Colonial Williamsburg Inn and Lodge, and the bakery. . . .Makes my mouth water to think about it. . . .
Every Christmas I send my friends Christmas Card Recipes. . . .A small token I share for them to enjoy at Christmas or to tuck away until later. . . . 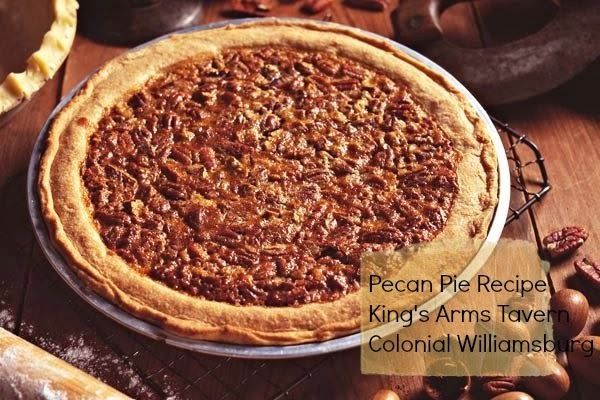 This year I chose the King's Arms Tavern Pecan Pie. . . .It's very easy. . . .and always delicious. . . .It includes a pastry crust recipe that is wonderful also. . . .although I admit that I often use the frozen pastry when in a hurry. . . . 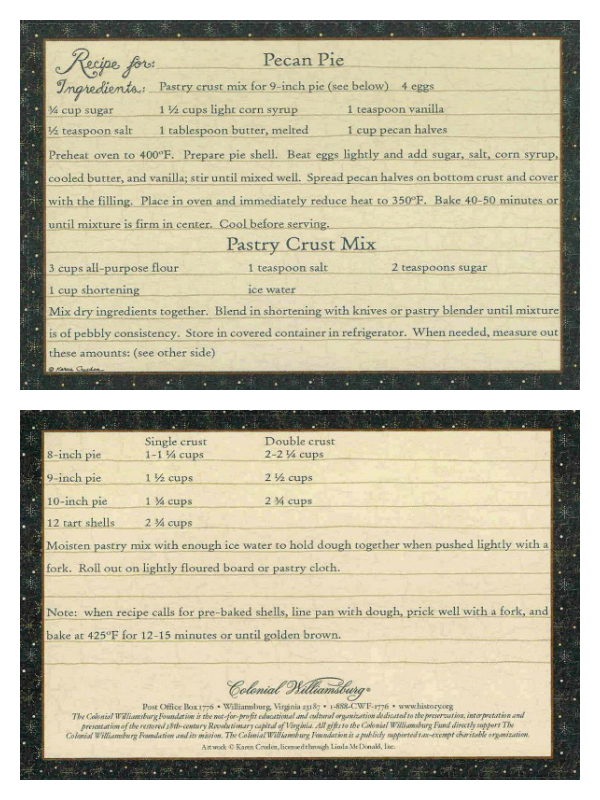 Since you, my blogging friends, are so special to me, I thought I'd share a Card and Recipe with you! A Southern Classic. . . .Hope you enjoy it. . . .
Oh! and Feel free to print out the recipe to share with your friends. . . . This looks wonderful! Thank you, and Merry Christmas! Oh we love Pecan Pie! Though we don't always have it for the holiday especially with the price of pecans so outrageous! Have you ever tried it will honey? I think it helps keep the sugary taste down. Going to visit Williamsburg is one of my dreams! I would also love to work there. Yum thank you for the recipe. You are so sweet just like this pie I am sure tastes. Merry Christmas. Enjoy the holidays. I love Pecan Pie! You must have had so much fun working at Williamsburg. Such a beautiful and historical place to see although I've never been there. Have a wonderful Christmas season with your family! Oh how I love pecans! 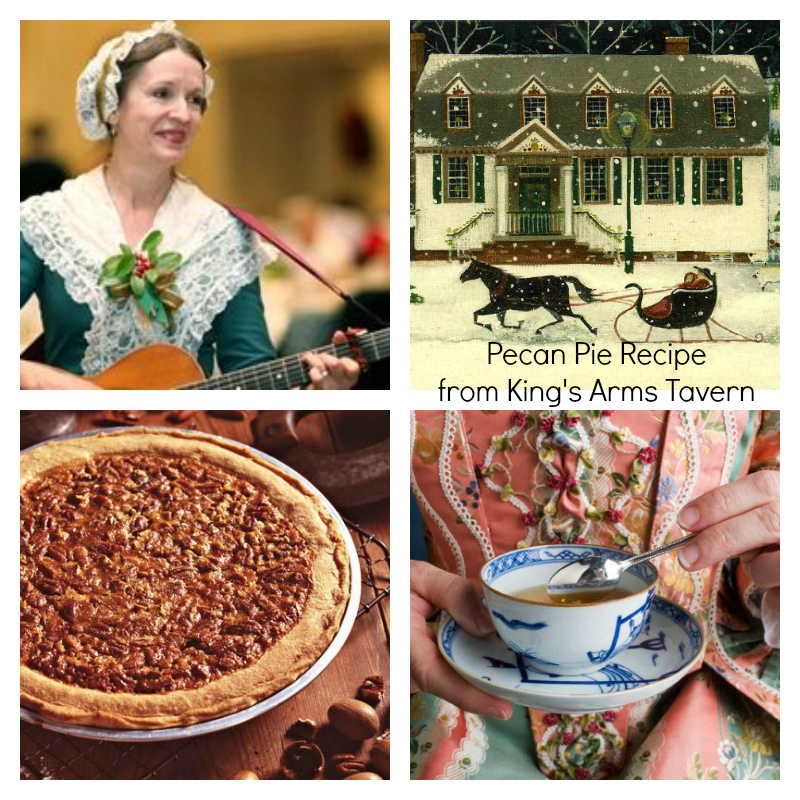 Pecan pie is such a decadent treat, thank you so much for sharing this wonderful recipe. I hope you and your family have a very Merry Christmas! One of my two favorite pies Dru. I use my mom's recipe which I love. It calls for dark karo. I think I need to try this one sometime too. Sure hope Mom don't frown down on me from heaven. lol! I know she loved trying new things too. Have a very Merry Christmas! We love pecan pie! We lived in Williamsburg for 5 years, only a few miles from downtown. We enjoyed it so much! Thank you for sharing this, I shared on Joyous Notions also! Thank you Dru! What a nice gift. I will share this recipe with my friends, I love that idea. We have been to Williamsburg, and live not too far from Plymouth Plantation. 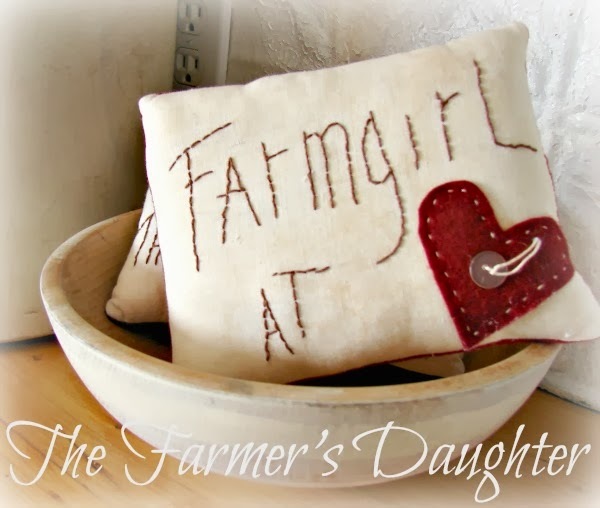 I live in a reproduction of a house from Lakeville, MA and just love your blog! What a lovely post, I love the white candles, pillows, and blanket, so peaceful looking. Enjoy time with your family. The Memory Box. . .